Hi everyone. 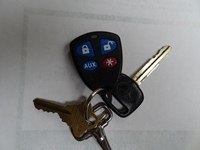 We recently acquired a nice 1999 RAV4L 2WD 165K miles and wondered if I can turn off the horn feature when unlocking/locking the doors with the remote fob. The horn is very loud rather than a piezo beep/chirp like on my dad's 09 RAV4. Found nothing in the owners manual, or TOYOTA REPAIR MANUALS I bought off ebay. We come and go late night for work and don't want to wake the neighbors so we only use the door key to open. It's even a little annoying in public parking lots I think to get a loud double beep every time. That sounds like an aftermarket or dealer-installed alarm system. There wasn't anything installed from the factory that did that. A lot of dealers did install the Toyota RS3000 alarm system, but that system has a "chirp" sound, and only uses the horn as the actual alarm noise. Alarm systems have their own ECU's added to the vehicle, so if you find the ECU get a model number, you might be able to search it out online, determine the signal wire for the horn, and snip it. But you'd want a wiring diagram before you go doing anything, especially if the alarm has an immobilizer function. The alarm ECU's are usually installed either under the driver's seat, or behind the trim in that area. Do you have the original Owner's Manual? At least later generation RAV4 manuals contain a list of customizable features, one of which is the ability to disable the horn when doors are locked or unlocked using the key fob. If so, the feature can be disabled by a dealer or by using Techstream. Here is a link to a forum thread with a list of features for a later generation RAV4. Scroll down to Quickdtoo's post.which has a comprehensive list. Don't know whether this also applies also to gen.1 RAV4s. That remote looks like a Viper remote start/alarm aftermarket system. Look for a small black or red push switch, usually hidden somewhere below the dash or steering column. The button is used to disable and program it, including adding another remote. The picture is kind of small to get a good look at it. It's all about seeing, being seen and stopping!